Before the advent of dental implant, there were only limited options to replace the missing teeth. Previously only readymade prostheses of teeth were available which were not matching to the individual requirements. Time has changed and people have become more beauty conscious. In tandem with the changes in the attitude of the millions, the cosmetic dental surgery has evolved and as a part of it the dental implant has become the vogue of the day. The most important aspect of dental implant is that the implants made of titanium are fitted to the bone of the jaw which replaces or substitutes the root of the teeth. Before making the prosthesis for a particular person, the impression of his teeth is taken. From the impression thus obtained, the requirement of each individual is clearly known. Based on this information the prosthesis is made in conformity with the requirements so that it exactly fits as if it were the original teeth. 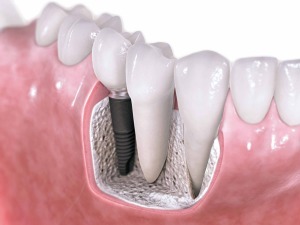 As the implant is made according to the requirement of the individual case they are very helpful in maintaining the characteristic smile of the individual. It helps him to speak in the normal way without any hitches or slurring. It also helps him to continue his normal eating habits without any pain or other obstacles. The look and feel produced by the implant is so natural that you don’t even feel that your teeth has been replaced or changed. As these implants do not need the support of the neighboring teeth to fix them in the jaw they are very much helpful in maintaining the general dental health. As per the scientific date available, natural teeth are subjected to very great stress of about 540 lbs/sq.inch inch while biting the food that a person is eating. Scientific studies have shown that a denture is able to bear only a stress of 10 lbs/sq.inch while chewing whereas an implant can withstand a stress of 450 lbs/sq.inch. Surgical grade titanium alloy is used in the preparation of dental implants which are absolutely compatible with human body tissues. The option to select the dental implant from a wide variety of designs available in the market is a great boon of the dental implant. Most matching design can be selected considering the individual requirements based on the factors like positioning of anatomical structures including dental nerves, blood vessels and maxillary sinus.